Need the versatility of the Opel Zafira, but not the seven seats? Then Opel's Meriva is a possible answer, with a smaller footprint on the road, allied to lower running costs - not to mention purchase price. Need the versatility of the Opel Zafira, but not the seven seats? Then Opel's Meriva is a possible answer, with a smaller footprint on the road, allied to lower running costs - not to mention purchase price. 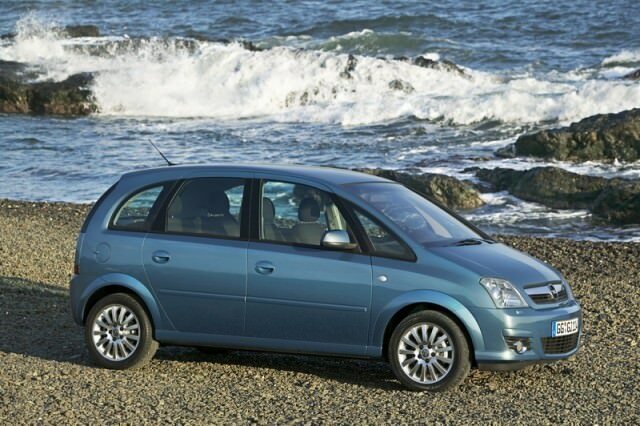 Introduced in 2002, Opel was early to the mini-MPV marketplace, though the Meriva has hung around for a long time since its 2002 introduction. It was facelifted a bit in that time, though nothing too radical, and regardless of its age it is still a useful, space efficient vehicle. The Meriva might be relatively small on the outside, but it's tall, and that allows for plenty of head- and legroom. The rear seats are dubbed FlexSpace by Opel and unlike so many rear seats they can comfortably accommodate three adults back there. They also fold completely flat to offer a load space of up to 1,410 litres if you need it to double up as a van occasionally. The range follows Opel's usual options of Life, Design, Club, Expression, while some of the older examples are also available in Enjoy specification. All come with a reasonable level of equipment, though there are enough out there to be picky if you're after particular items like air conditioning or alloy wheels. Engine choice is made up largely of 1.4- and 1.6-litre petrol units and the occasional 1.7-litre turbodiesel. The 1.4-litre engine will be enough if you're predominantly urban based, its 90hp delivered in a willing fashion, even if the rather slovenly 13.8-second 0-100km/h time doesn't suggest it. The 1.6-litre only shaves about half a second off that, and it's available with an automatic gearbox, though if you're after a two-pedal car the performance suffers even further. The high seating position up front gives a great view out, the large glasshouse also aiding visibility and ease of parking. The dashboard is simple and rather workmanlike in its layout, but its tough plastics stand up to the sort of abuse only families can mete out. Rivals are few at the price point the Meriva is available at, thanks largely to the Meriva being one of the first of its types, but a Toyota Yaris Verso offers similar usefulness - if rather odd styling - as does Honda's cleverly packaged Jazz. The 1.4-litre petrol engine mixes reasonable, if not firecracker, performance with respectable economy and emissions. There's plentiful choice too, so unless you need an automatic gearbox it's the one to go for. Opel's Meriva was among the first to the mini-MPV party, and although it's far from remarkable it's a smartly packaged, space efficient family vehicle. In summary, it's a no-nonsense and inexpensive way to get your family, and a lot of the paraphernalia that they bring, around.